Buy Cake Boxes Directly from the Cake Box Factory for Sweet Savings. You have found the source for premium cake boxes! The relationships we enjoy with cake bakers has allowed us to design and manufacture cake boxes that reflect the good stuff bakers look for in cake packaging: top quality at a wholesale price. Your bakery boxes ship free via UPS Ground, if you live in the Lower 48 States - no matter how small your order. We ship them to you fast, directly from the building where they were born. You spend a lot of time making your cakes look amazing. 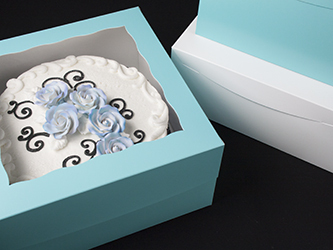 Elevate the elegance of your frosted works in a professional cake box crafted by box makers who care about quality and value the same way you do. You bake the cakes; we'll build the boxes! Visit our Samples Page and try a few cake boxes out in your own kitchen. We made special lids to fit this heavy duty base. The lids are item 3884 and 3705.